Nutrition-related social and behavior change communication (SBCC) can help improve the nutritional status of children during the first 1,000 days. In Southwest (SW) Uganda, the USAID-funded SPRING project designed and implemented a SBCC campaign called Great Mothers, Healthy Children. 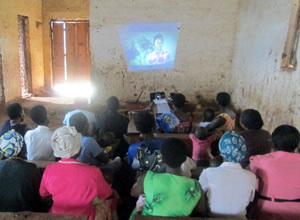 Based on the Community Action Cycle, the campaign involved village health teams using testimonial videos featuring community members as a medium for engaging parents and grandparents of children under two on critical nutrition topics in SW Uganda. SPRING/Uganda SBCC Specialist Moses Sebbale provided an overview of SPRING’s Great Mothers, Healthy Children campaign and introduced Carolyn O’Donnell, Nutrition Specialist at Save the Children, and Joan Jennings from the Technical and Operational Performance Support Program (TOPS), who shared the results of their assessment.